30 Second Scouting | Helping you make memories through Scouting. 30 seconds at a time. Helping you make memories through Scouting. 30 seconds at a time. One of my personal vices is that I spend way too much time on Pinterest imagining what my perfect organic, homesteading life would be like. My chickens would happily produce big beautiful eggs not at all covered in dirt or chicken gunk in their Martha Stewart-esque coop that I built using wood I reclaimed from an HGTV reality show build site. I would grow heirloom tomatoes in my quaint raised bed vegetable garden conveniently free of all pests because I dutifully planted marigolds at 6 inch intervals along the edge and scattered pepper on the ground below. After a sunny afternoon of gratifying work I would pick a handful of perfect green beans off of the vine, go into my airy, sunlit kitchen, and create a beautiful and delicious vegetable dish that my entire family will eat without bribing, cajoling, or any other form of coercion. Now, in reality I’m pretty sure that the chickens would try to kill me, I would kill the tomatoes for sure, no matter how many vines I planted I would still only reap one actual green bean, and no matter how much butter I put on it my children would still refuse to eat it and throw back in my face my own rule about not eating things you pick up off the ground. That’s just how my world works. However early every spring I do get the opportunity to feel just a little bit like the gardening, pioneering, natural food loving person I want to be when I get the chance to start seeds inside. You can buy special containers at the store but there are so many things that you can do with stuff around your house that there’s really no need. 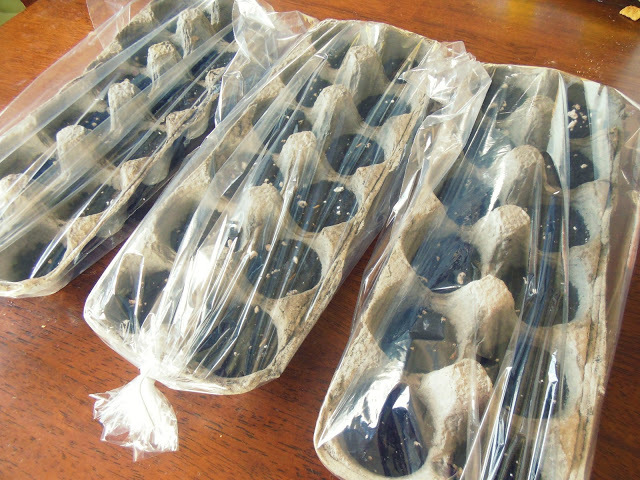 Egg cartons are great for starting seeds, all you need to do is use a needle to poke a couple drainage holes in the bottom of each cup and you have a 12 seedling container right there. 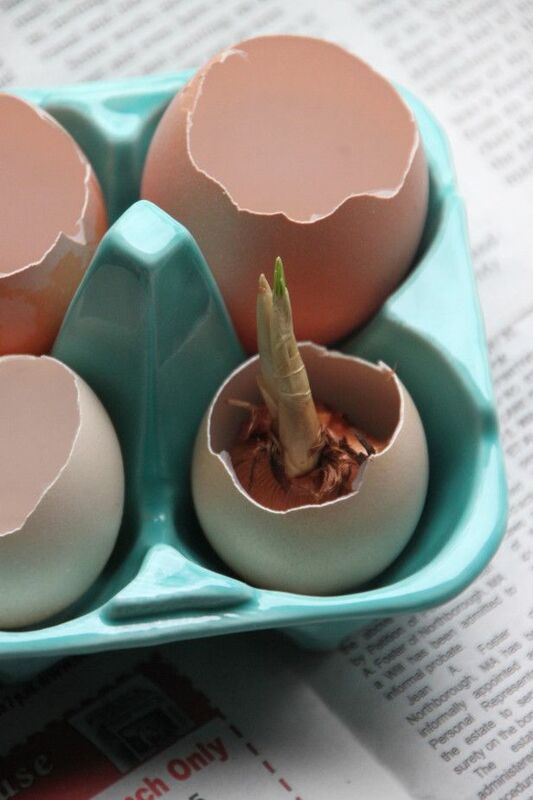 Some people even use 1/2 of an egg shell itself and bury it right along with the seedling at planting time (you can do this with half of an orange or lemon cored out as well). I’ve also seen a toilet paper roll cut in half (or paper towel roll in thirds) then put in a jelly roll pan used as a seed starter. Whatever container you use just fill it with a good quality potting soil, plant your seed and spritz with water. Wicked easy! 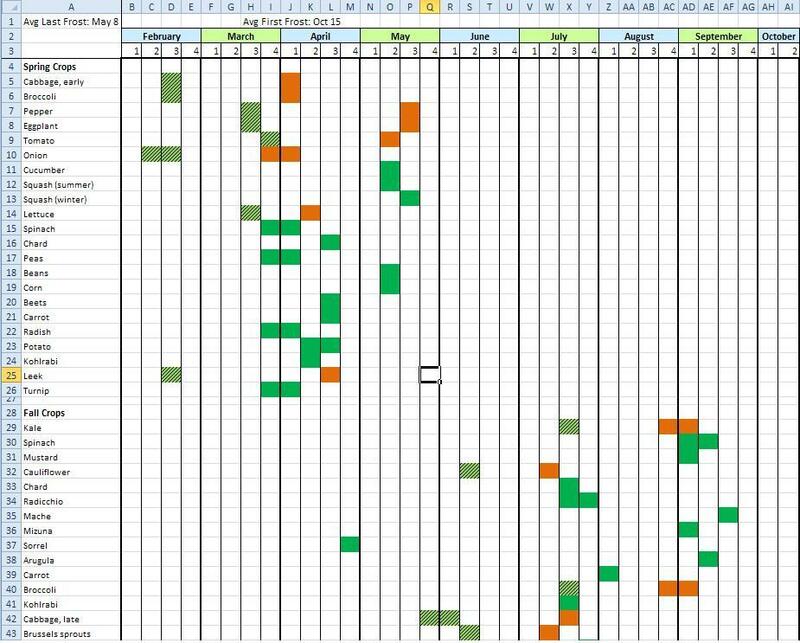 Different plants need different germinating times so here’s a handy chart I found online. You base your time off of when you think the last frost of the spring will be so that you can grow the plant enough to be sustainable without it getting to big before you can plant it. The last frost date in this chart is early May, which sounds about right for night temps in New England but you can fudge it a little either way depending on your neck of the woods. These things need lots of sunlight, like 6-8 hours a day, so in proximity to a window is good. 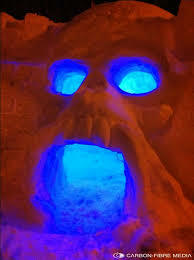 Some people buy special lamps but I don’t go there myself. I have a big bay window and they get good light from there while not getting too cold. If you put them in an outdoor sun room or something though they’ll freeze so find a good spot indoors. My grandma used to lay them on a plastic tablecloth on one of the guest bedroom beds because it was the sunniest spot in the house. This is usually where my carefully laid gardening plans fall apart. It’s actually a mild source of amusement tinged shame to me that I can keep four cats, two children, and a dog alive but give me a bunch of plants and it’s a horticultural massacre. After trying this over and over for years though I’ve noticed that the carnage tends to occur because I either over or under water the seedlings. They can be touchy about that sort of thing, either dying of thirst or growing all sorts of interesting fungus from being to wet. I heard a great tip though from a friend of my mom’s who told me to water the seedlings once, then loosely wrap them in plastic wrap. That keeps the moisture in and creates it’s own sort of ecosystem that sustains them with no further watering until it’s time to plant outside. I’m going to give this method a try this year and see how it goes. If this works I’m going to be so excited! One of the really neat things about America being such a large country is that seasonally, February and March look very different depending on where you live. Here in Boston we’re still looking at feet of snow still on the ground but down in Florida (where everybody in Boston wishes they were right now :)) they’re prepping for flower festivals at Disney and throwing on jackets if it dips below 60. 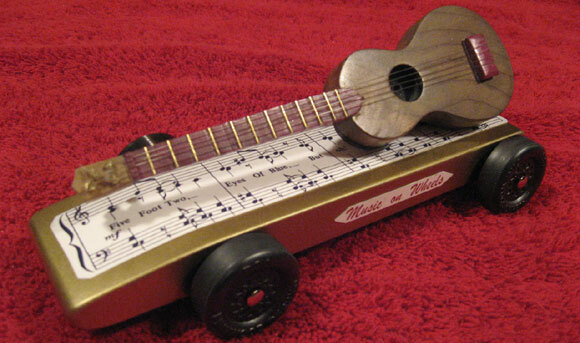 No matter where you live though, in the Scouting world February and March mean the same thing: Pinewood Derby season. And Pinewood Derby season means the need for speed. If you want to start tweaking your car to get the most possible speed you first have to know what makes the car go fast in the first place and the name of that game is energy transfer. When a car is sitting at the top of the track, ready to go down, it’s full of potential energy (or stored energy). 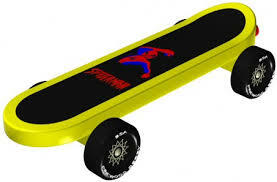 Technically potential energy is mass times gravitational force times height (Ep=mgh) but essentially in pinewood derby speak it’s the weight of the car times the height of the drop. The higher up on the track the weight is (ie the more towards the back), the greater your potential energy. Once the race starts and the car begins to move the potential energy is transferred into kinetic energy, 1/2 the mass of the object times the speed. Of course, the optimal word in that sentence is speed. The more energy transfers, the faster the car goes. That means that the more potential energy you start with the more you have to transfer to kinetic energy during the race. Now that means that all you really have to do is put all of the weight in the back of the car and you’re a shoo in to win, right? Nope. Let’s talk about center of gravity. A car can be super speedy but if it’s unstable it won’t make it down the track. 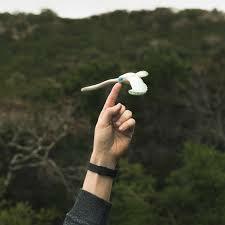 You’ll crash, you’ll flip, stuff will happen and even if it doesn’t somebody who is smarter about their weight disbursement will still be faster. All the science stuff above tells us that we want the weight towards the back but if it’s too far back you’ll pop a wheely somewhere on the drop and then it’s all, “Good try maybe next year.” You need to place most of the weight far back enough to make a difference but forward enough to still be stable. To help with that and translate the rest of this sciencey stuff into useful tips. Let’s check out the cliff notes. 1. CHECK THE RULES!!! BSA has official rules but a lot of Packs add their own and you don’t want to get disqualified because you did something that you thought was OK but your Pack doesn’t allow. That would stink! 2. Max out the weight of the car. That’s 5 oz in the official rules and tends to stay standard. 3. You want the most weight somewhere between 1-1.5 inches from the rear axle of the car. That will keep you stable and make you fast. 4. Create a streamlined profile. 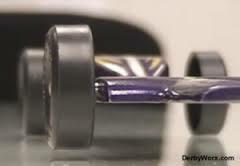 You might not think aerodynamics would matter but this crazy physics professor out in California did a huge set of experiments with pinewood derby cars and found that an aerodynamically cut profile will beat the standard block of wood by over 5 inches (you can watch the whole thing here: http://pinewoodphysics.com/index.html). A low profile might not look exciting but it takes a lot of the weight of the wood out of the car and that allows you to control more of the weight and center of gravity while also reducing air resistance. If you’re competitive enough to be reading this post, it’s totally worth it to put some thought into how you cut the car . 5. Graphite. Graphite is a smoothing agent and reduces friction. By now we all know what that does. The cool think about graphite is that it doesn’t really matter what type you get, they all do the same thing, so you don’t need to bust your wallet on special stuff, you can just get the cheaper kind and it will still work. 6. Raise one of your wheels. In a perfect world all of the potential energy converts over to kinetic energy during the race but unfortunately we lose some of it to friction, that’s the wheels turning on the track. As an example think of a regular train verses one of those crazy Japanese high speed trains. Those high speed ones work using electromagnets that suspend the train above the track, eliminating friction, that’s why they go so fast. When you raise one of your wheels you reduce the friction points from 4 to 3 and that means less energy is lost to friction. 7. Straighten and polish your axles. The straightening helps you keep a straight alignment so that your wheels don’t wobble as they go down the track and the polishing, again, reduces overall friction. Now there are a whole bunch of other things you can do in order to increase the speed of your car but really that depends on how crazy you want to get. The most important thing though is to have fun with it. Not even a….wait, who am I kidding? The night before Winter Camp in my house is like a twister meeting an outdoor yard sale. Swimwear and snow pants strewn across the living room floor, Walt running through the house waving two left gloves because he can’t find a matching pair, cats dashing for the bedrooms (like those are safe), and long, surprisingly engaging debate about the merits of a fluff sandwich over a fluffer-nutter. I hold the line that you can’t only have fluff in a sandwich – therefore we ended up with a bagel. Then, right when the snow pants and swimsuits had been squashed into a backpack, the lunchboxes were made up and I’d finally convinced Grace to at least put a brush in her backpack for after the pool it comes. “Mooooooooommmmmmmm, I can’t attach my boots to my backpack!” This is a problem in my family because my children will immediately and irretrievably lose anything not physically attached to their backpacks. Lunchboxes? Lost. Water bottles? Lost. Boots last year? You betcha! So we attach everything to their backpacks. But there’s no need to fear lost boots on this trip (at least not because they weren’t attached) because of my favorite accessory in the whole wide world…the carabiner. Put it in the end of a dog leash and you can use it to tie the dog if you need to for a minute. 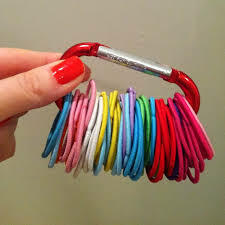 I was doing this back before I knew it was called a carabiner. I still called it a clippy thing. And LOVED it. 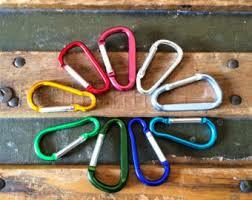 Today carabiners come in all sorts of colors and sizes. I even have a friend with a beautiful sterling silver bracelet that’s got a carabiner for a clasp (she’s a ropes course instructor). 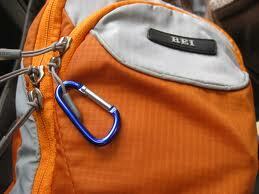 You can find carabiners at Home Depot, the grocery store, even Target and it’s totally worth it to pick up a few. Along with extra boots, because you all just know how this is going to end…. So here in the Boston area we got 2-3 feet of snow this week. There’s so much snow on the ground that I’m measuring it by how far the kids sink into it when they go play outside. At Camp Sayre the snow is fantastic news for those of us who have been waiting all season to show off the winter program. Snurfing, sledding, ice climbing, it’s all open and to kick the weekend off we’re out building Quinzee snow shelters tomorrow. Ok! So a couple of hours have gone by, the rooms are clean, and the snow is all set. Time to….get a bunch of sticks! You don’t want to accidentally create a tunnel instead of a snow fort so you need to have a way to measure out the thickness of the quinzee walls. Get a bundle of sticks all around the same size. Think the distance between a grown up’s fingertips and elbow. Then stick them all around your dome-pile of snow at regular intervals with just a few inches of stick poking out of the top. It should look like a giant stumpy mutant snow porcupine. NOW it’s time to hollow out the quinzee! A word of caution though, never do this alone. It’s not normal but sometimes the snow can collapse in on you during construction and you’ll want a friend nearby to help you dig out if that happens. See what I mean about the stubby mutant porcupine thing? Start with an entry tunnel. If you’re super cool you can actually dig this part a little lower down and the tunnel up into the main dome part but if it all comes level that’s OK too. Then start hollowing it out from the top down. As you’re hollowing out the snow dome start to be careful when you can see some daylight through the snow and keep an eye out for those porcupine sticks, they’re your signal not to hollow out any more, your wall is thin enough. This part is going to take a while, a couple of hours or so. Oh No kids, the quinzee ate daddy!!! 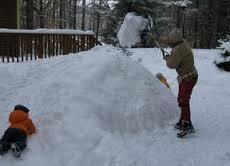 Once you’re hollowed out enough use the last of the inside snow to make a snow bed or two for you to put your sleeping bag on (this is totally optional and if you are not the Martha Stewart of snow fort builders the sleeping bag can go on the ground or a pile of snow just fine). Keep the bed to the side and pack it down hard. 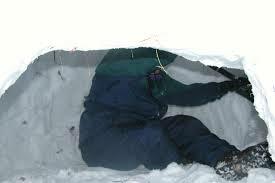 Next carefully make a few holes in the quinzee for fresh air. Removing the porcupine sticks and carefully making one or two bigger is a handy way to do this. One right at the top is great and sometimes people do another one or two further down on the side. 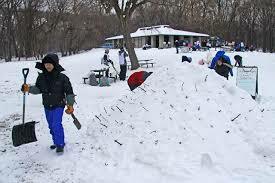 Then shovel a path all the way down to the ground leading to the opening, this will funnel cold air from your air holes out of the quinzee and away from you. With the insulation from the snow walls your trench for cold air the quinzee can maintain around 30 degrees even on nights that are much colder. If you’re feeling fancy you can even carve out a shelf or so to put your lantern and snacks on. And the Oscar for best use of air holes goes to…. 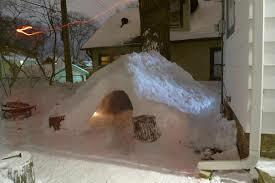 Now you have a great backyard fort for playing and overnight camping. 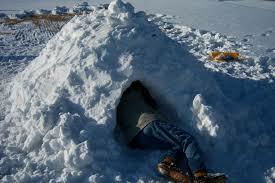 If the weather stays cold it can last for the whole winter until the snow melts. Have fun and stay warm! After an unusually warm holiday season in Boston winter arrived with sub zero temps this week. Now, I’m not a fan of the cold myself but for Camp Sayre this is awesome! 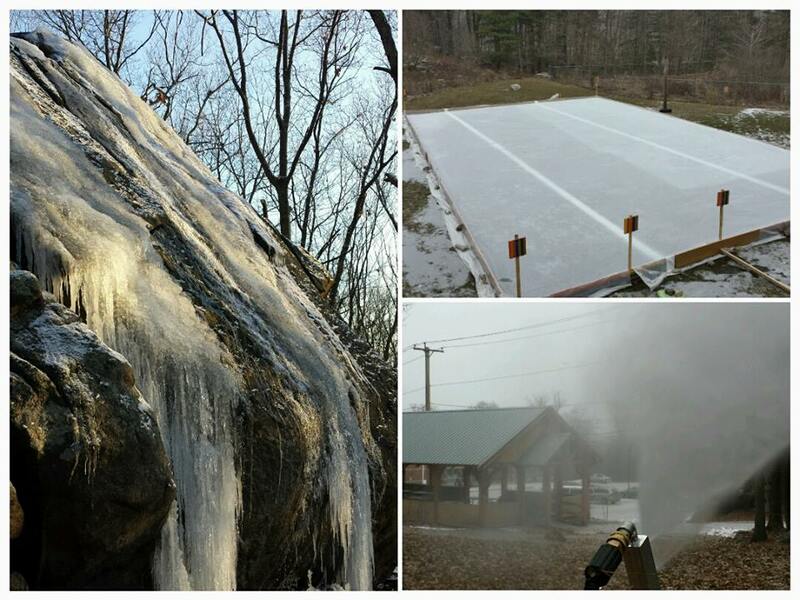 After weeks of waiting for it to get cold enough we were finally able to start prepping our winter weekend program and today the snow maker was running, the ice skating rink was solidifying, and ice is thickly coating lookout rock for ice climbing. By the time we open for the weekend our full menu of winter weekend activities will be ready to go! Have your little ones drop the food coloring in the empty balloon first, then fill it with water, tie it off, and leave it outside overnight. By morning you’ll have a solid frozen ice marble. Check to be sure it’s frozen solid by shaking it gently and listening for liquid sloshing, if you hear anything let it set out some more until you’re sure it’s solid all the way through. 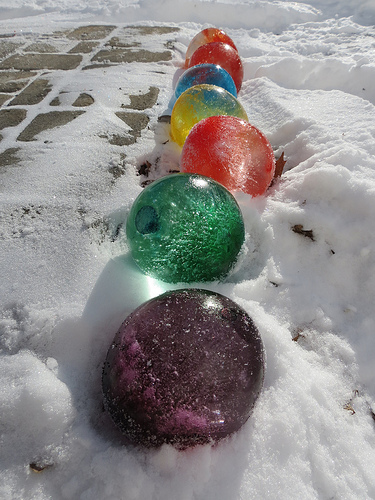 Once you know it’s solid just unwrap the balloon from around the marble and the children have made a beautiful yard ornament that will last all winter. 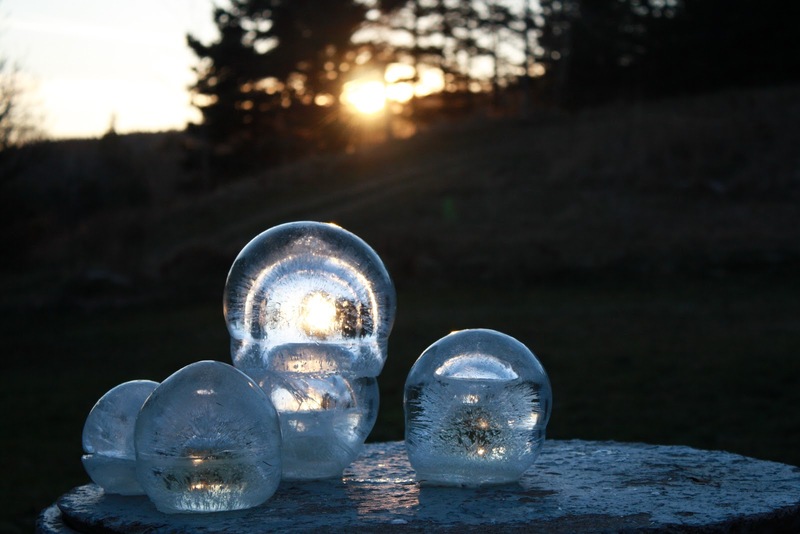 They can play ice marbles, try out some ice bowling, and when they’re all tired out they can just leave them in the yard and everybody thinks you went all Martha Stewart with the natural winter decorations. If you want to get really fancy you can use a 1″ drill bit to drill out the bottom of the marble and insert an electric candle in the space. 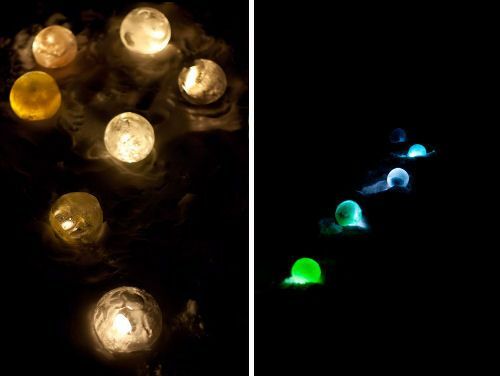 It will glow from within when it gets dark and looks really great! Look! Up In The Sky! 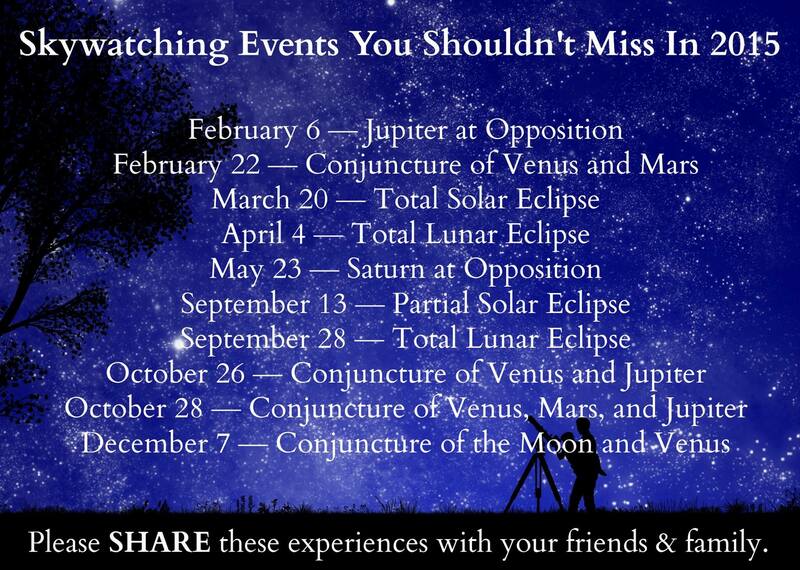 It’s Some Major Astronomical Events of 2015! A few days ago a page I follow on Facebook posted a great pic highlighting the major Astronomical events of 2015 and asked people to share with friends and family. Conjunction (being in conjuncture) is when two objects in the sky look like they are passing close to each other in their orbit. In actuality they aren’t really that close, they’re light years away from each other in some cases, but because of how we see them in the sky they look close and that can be interesting to see. 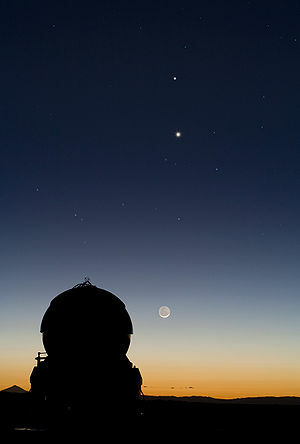 In this photo Mercury and Venus are in Conjuncture above the moon. At least that’s what Wikipedia says. Personally I like to think it was taken on Tatooine and that little bump on the observatory is really a young Luke Skywalker. Opposition is when an object is at the opposite end of the sky. In the case of most objects, including planets, this means opposite the sun and often closer than usual to earth in it’s orbit. The effect of that is the planet gets bigger and brighter in the sky. As an example, when the moon is full it is in opposition to the sun. If it is exactly in opposition then the earth gets in the way of the sun and moon and there’s a lunar eclipse. You know you automatically superimposed ET and Elliot on his bike over this picture. You know it. I know it. In 2015 the smallest full moon of the year will be on March 5th, called a micro moon. The largest full moon of the year will be on September 28th but it will also be in the process of a lunar eclipse, wicked cool! Here’s a little more detail from Scott Dance at the Baltimore Sun, who added some descriptors for each event and meteor shower dates as well. Make New Year’s Resolutions With Your Children This Year! Ahhhh, New Year’s resolution time. The most well-intentioned week and a half of my year. Over the course of my adulthood I’ve resolved everything from the standard “lose weight” to the more adventurous “write a novel” but I’m afraid I remain more pounds than pages at the close of 2014. 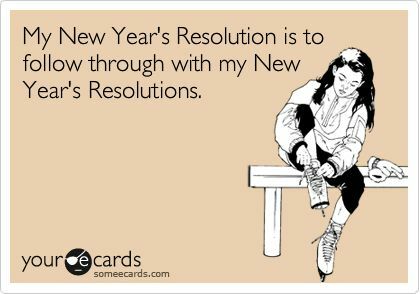 New Year’s resolutions aren’t bad though, in fact they’re great. One of the things that the Boy Scout Handbook talks about -in the Leadership section no less- is that goal setting is a huge part of learning to be prepared. After all, you can’t achieve a goal without planning out how you’re going to do it. Essentially, without being prepared to succeed. 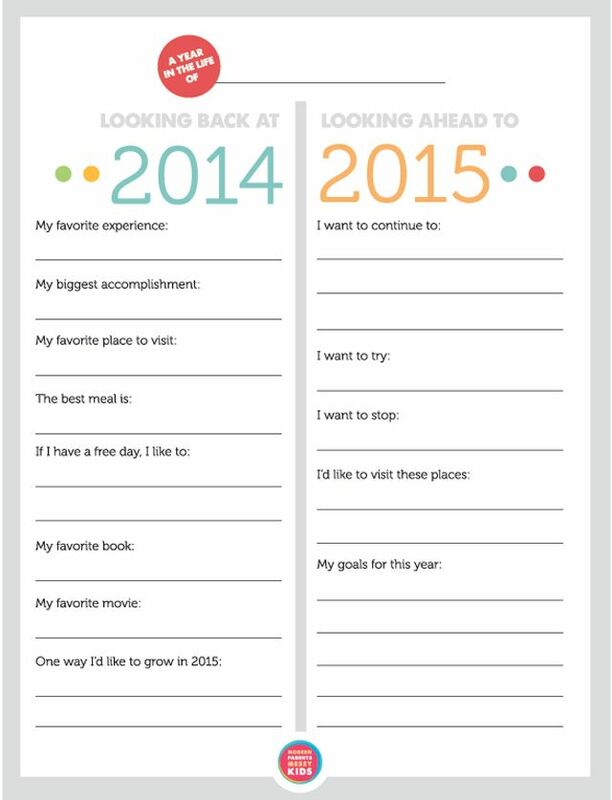 For children though, goal setting can be a big and sometimes scary thing (come to think of it, for adults as well) so I was super excited to see that Modern Parents / Messy Kids created a free downloadable worksheet to help kids remember the great things they did in 2014 while making their own resolutions for 2015. This worksheet is just begging to be done together with a parent and then kept stuck to the fridge with a gold star sticker next to each accomplishment. Kids start recapping the 2014 year and remembering goals they accomplished that they might have forgotten about. That builds confidence and helps you remember the great parts of 2014. Then it’s on to 2015 and all sorts of big plans! What I really loved though was how it helped me open a conversation between myself and my children. When I gave it to Grace she shocked me by saying, ” I want to stop having pizza every Friday.” That started a conversation that was really about her wanting to spend more time cooking dinner with me and her dad. Fantastic! So have a wonderful New Year in 2015. May your resolutions last and your next December be full of smiles and good memories.